Richard Heath (January 2011): A big thank you for making your website! It's inspired me to search my family tree. The photo shows Mafeking Ave, where I spent my 1st 5 years. I have many connections to people mentioned here, and thought I'd write a little about them. My name is Richard John Heath born 1959 (Ricky to family & Friends). My mother, Geraldine ROWE, Is the May Queen pictured in the photo by Brenda Bostock, and also in the class of 1951. She married my father 1958, Raymond HEATH, Son of Cyril Heath & Lillian SNELLING. 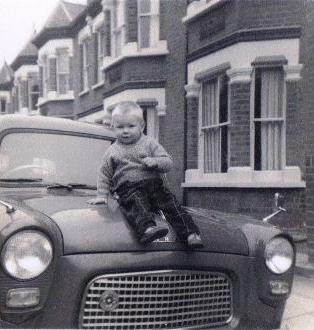 As a child they lived at 4 Cressage Road (now demolished & I believe Cressage house stands on the site). The photo shows Cressage road, taken from Ealing Road end I believe. 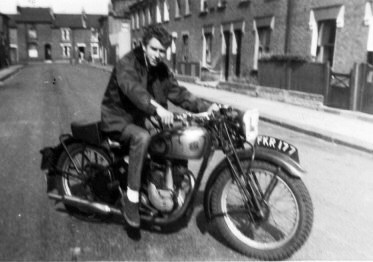 My Father is on his 1st Motorbike, I guess about 1957. Cyril born 1911, was the youngest of 11, his twin sister Eva, died at birth, & another sibling also died in infancy. His older brothers & Sisters are John 1894, Beatrice 1897, Joy 1896, Annie 1903, Lillian 1909, Betsy 1901, Thomas 1899 & Ivy 1896. Their Parents where John Heath & Betsey DEAR, although the Johns in the Family seem to have been known as Jack (quite common apparently!). Annie Heath married Claude DAUBNEY, as per your entries Dear & Daubney. The Heaths were the Undertakers in Ealing Road, and later at 330 High St. The building in Ealing Road, corner of Albany Road, still has the cross on the top of the roof! Cyril's Grandfather was Thomas Heath 1839 Carpenter/Undertaker, wife Zilpa SEARES. His father was also Thomas Heath 1803 from Chalfont.St Peter Bucks, wife Mary. My Grandmother, Lillian Snelling, had at least 4 siblings ( I haven't done much research as yet) Violet, Jack (or John), Phylis & Dorothy. Her Parents William Snelling 1875 and wife Annie 1883. William, was a Lighterman for the Port of London Authority. His father, also William Snelling 1853, wife Charlotte 1855. He was a waterman also.